Urban Alchemy Project led by Lily Yeh of Barefoot Artists began a dialogue to address racial inequality, separation, segregation, brokenness, poverty, lack of community-driven solutions, disempowerment, isolation. The projects aims to allow residents to see how art can help to heal and create as well as participate in a process within a unique environment that bridges neighborhoods. Urban Alchemy involved two phases, both included day long workshops and installations underneath the Holton Street Viaduct. In addition to the activation of this space, one significant outcome was the connections and relationships produced between a core group of artists, a network of community members and Lily Yeh, a renowned international artist whose lifelong practice has enabled public art to bring people together and create harmony in places often underlooked. 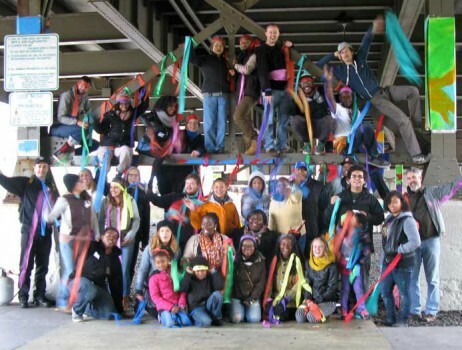 Lily Yeh co-created with artists, neighborhood residents, children, and volunteers on an art installation that transformed a sterile and unfrequented urban space — Holton Viaduct Swing Park — into a colorful and jubilant place. The lively process, fun activities, and the colorful environment not only refreshed participants’ energy, but also drew the attention of passing visitors — including two wedding parties! Attracted by our brightly colored columns and streamers, the newlyweds had their pictures taken with us. Urban Alchemy also worked with The City’s Department of Public Works to grant permission and timeline for community based installations. Finally, this two phase process included many planning and reflection meetings which has fortified relationships with five local artists. We intend to continue Urban Alchemy with a Phase 3, planned for spring 2015 with Lily Yeh to extend the process and production along Holton and or the Beerline Trail extending into Harambee along the Artery, with potential support from the Greater Milwaukee Committee, Riverworks, and the Kresge Foundation. We anticipate this will follow a similar model of workshop fabrication and installation and will include public outdoor screening of Lily Yeh’s Barefoot Artists. Read more about the project from the Milwaukee Neighborhood News Service.